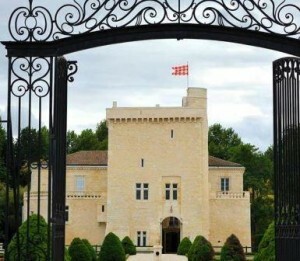 Chateau La Tour Carnet, owned by Bernard Magrez, is one of the oldest Bordeaux wine producers that has remained continually active in the entire Bordeaux appellation. The chateau is also one of the oldest structures in the region. In fact, some parts of the building, specifically the round tower, date all the way back to the 11th Century. At the time, it was a fortress that was inhabited by the English as early as the 12th Century. What we know of as Chateau La Tour Carnet today, was an important fort that was used by the military as an outpost in Bordeaux. 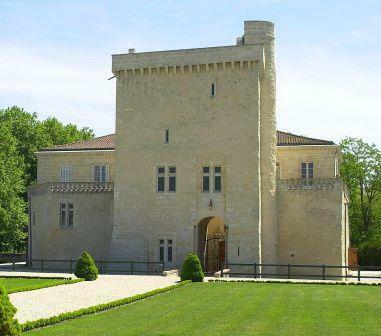 The chateau of La Tour Carnet is one of the few remaining Bordeaux estates to have a working moat and drawbridge. Originally, the property went under the name of Chateau de St. Laurent. The land eventually fell to French rule. After centuries of war, the ruined property passed through the hands of a succession of owners, before it was obtained by Charles de Leutken. Chateau La Tour Carnet remained with the Leutken family for generations. The current owner of La Tour Carnet is Bernard Magrez. Magrez is the proprietor of a number of other Bordeaux estates, most notably Chateau Pape Clement in Pessac Leognan. Bernard Magrez bought the estate from the Pelegrin family in 1999. Additionally Bernard Magrez owns numerous other Bordeaux estates including Fombrauge in St. Emilion. One of the first things Bernard Magrez did after taking over Chateau La Tour Carnet was to increase the size of the vineyards. When the property was first taken overboard by Bernard Magrez, the estate had only 44 hectares of vines. By 2018, their holdings had increased to 190 hectares. Chateau La Tour Carnet is now one of the largest vineyards in Bordeaux and they are also one of top producers in the Haut Medoc appellation area today. The large, 190 hectare Left Bank vineyard of La Tour Carnet is well placed in the Haut Medoc appellation. They are not far from some of the top vineyards in the St. Julien appellation. The vineyard is planted to 50% Merlot, 45% Cabernet Sauvignon, 3% Cabernet Franc and 2% Petit Verdot. The percentage of Merlot planted in the vineyard has increased since it was purchased by Bernard Magrez. The majority of the vines are in one massive parcel, which is unusual for the region. The terroir of La Tour Carnet is gravel, clay and limestone soils with gentle, rolling slopes. They are inland, between the 2 main roads, the D2 and the D1. The vines are on average 30 years of age. The vineyard is planted to a vine density that ranges from from 8,000 to 10,000 vines per hectare. The newer plantings are down at the higher levels of vine density. To produce the wine of La Tour Carnet, the grapes are whole berry fermented, after being cooled to 8 degrees Celsius in a cryogenic tunnel by using liquid Azote, which is a type of nitrogen gas. Vinification takes place in a combination of large wood vats and stainless steel tanks. Malolactic fermentation takes place in vat. Between 85% to 90% of the wine is aged in on average, 60% new, French oak barrels. The remaining 10-15% of the wine is aged in large, clay, amphora. The aging period is on average about 18 months before bottling. Bernard Magrez also produces a special cuvee from 100% Merlot from the vineyards of La Tour Carnet called Servitude Volontaire. The vines are located in the north east portion of the Medoc, close to St. Seurin. The tiny, 500 case production of Servitude Volontaire is sold exclusively at retail shops owned by Magrez in Bordeaux as well as in Paris. Servitude Volontaire made its debut in 2003. Starting with the 2010 vintage, Chateau La Tour Carnet began taking anti counterfeiting measures using the Intaglio method of bottle etching coupled with Spottag, which adds an invisible ink on the labels. Chateau La Tour Carnet added a dry, white Bordeaux wine to their portfolio in 2008. The grapes come from a small, 2 hectare parcel of vines. For the white wine, the vines are planted to 33% Sauvignon Blanc, 33% Semillon, 29% Sauvignon Gris and 5% Muscadelle. However, the actual blend can vary widely. The vines are planted in a cooler terroir with more limestone in the soils. As you can see, Bernard Magrez is a fan of Sauvignon Gris. In fact, Bernard Magrez also includes the grape as large part of their blend for use in Chateau Pape Clement Blanc as well. Because white wine grapes are not allowed by law in the appellation, the wine is sold as a generic AOC Bordeaux Blanc. On average, close to 15,000 cases of Chateau La Tour Carnet are produced each vintage. There is a second wine, Les Douves de Carnet. The estate also produces a wine from vines located outside the Haut Medoc appellation, La Tour Carnet Cuvee La Bravoure, which is sold as a Medoc Bordeaux wine. Chateau La Tour Carnet needs time before it can be enjoyed. Young vintages can be decanted for an average of 1 -2 hours or so. This allows the wine to soften and open its perfume. Older vintages might need very little decanting, just enough to remove the sediment. Chateau La Tour Carnet is usually better with at least 5-7 years of bottle age. Of course that can vary slightly, depending on the vintage character. Chateau La Tour Carnet offers its best drinking and should reach peak maturity between 5-15 years of age after the vintage. Chateau La Tour Carnet is best served at 15.5 degrees Celsius, 60 degrees Fahrenheit. The cool, almost cellar temperature gives the wine more freshness and lift. The wine of Chateau La Tour Carnet is best served with all types of classic meat dishes, veal, pork, beef, lamb, duck, game, roast chicken, roasted, braised and grilled dishes. Chateau La Tour Carnet is a perfect match with Asian dishes, hearty fish courses like tuna, mushrooms and pasta as well as cheese. La Tour Carnet maintains one of the strongest research programs in Bordeaux, focusing on the potential, future problems Bordeaux will face, due to continuing climate change. Much of this is due to the fear that eventually it will become too warm for the Merlot grape. Experiments are taking place with various different grape varieties and clones to protect the heritage and quality of Bordeaux wine. With a nice jolt of lemony freshness, you also find pomelo, vanilla and yellow tropical fruits. This will be perfect on release and over the next few years. The wine was made from blending 60% Semillon and 40% Sauvignon Blanc. Light in color, this wine offers lemon peel, herbs and licorice on the nose. In the mouth, you find fresh yellow citrus fruits and a trace of honey that remains with you through the crispy finish. The wine was made from blending 60% Semillon and 40% Sauvignon Blanc. Scarlet hued, this wine offers an earthy, smoky, forest and blackberry profile. On the palate, this is fleshy, voluminous and smooth with fresh, dark red fruits, licorice and strong notes of toasty oak in the finish. Deeply colored, this is already showing off its round, concentrated, lush, display of ripe, dark, sweet, ripe fruits, smoke, licorice, dark chocolate and espresso. Dark in hue with loads of fruit, density and a fruity, concentrated, round textured, fleshy finish. Much better from the bottle than from the barrel, the round textured, forward wine provides a plummy, licorice, espresso and dark cherry nose. Polished, lush, ripe fruits, licorice and espresso complete the experience. Full bodied, round, forward and a touch oaky at this stage, with a large dose of licorice, coffee and black cherry in the finish. Smoke, oak and sweet ripe fruits, with an open, forward, sweet, black cherry, vanilla character, that is ready to drink. Modern in style, this Merlot dominated, deeply colored wine opens with a perfume filled with coffee, licorice, black and blue fruit and chocolate. Concentrated, fleshy and flashy, produced from a blend of 53% Merlot, 40% Cabernet Sauvignon, 5% Cabernet Franc and 2% Petit Verdot, this delicious Haut Medoc needs a few years before the oak fully integrates. From a blend of 52% Merlot and 48% Cabernet Sauvignon, the wine is still on the oaky side with coffee bean, vanilla, licorice and black cherry notes in the aromatics. Soft, round and forward, while not complex, it's fun and already easy to drink. Still just a bit oaky, but over the years, the wine has better integrated the wood. Full-bodied, round and with some firm tannins, the wine offers loads of black fruit, thyme and tobacco on the nose and palate. Cigar box, tobacco, black raspberry, medium bodied, soft and ready for business. Dark in color, this powerful wine offers pungent aromas of blackberry, cassis, truffle, earth, tobacco, coffee and blue fruit. Ripe, tannic and a little rustic, this robust, Bordeaux wine needs at least another 5-8 years in the cellar before it softens and comes together. Not much in the way of elegance. But there is gobs of fruit as well as tannin. Give this beast at least 10-15 years before popping a bottle. Still oaky, with licorice, tobacco and black fruits. Round textured and easy to drink, this is probably not going to get much better with age.